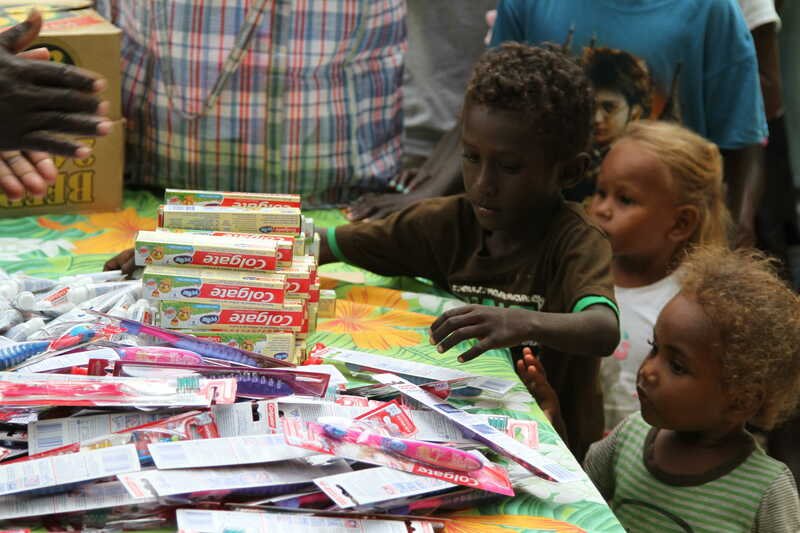 Recently Medland Dental Centre was very pleased to be able to help out some of our patients, the Firrell family, to assist with the oral health of children in a small community within the Solomon Islands – Mavo Village. Mavo Village is located on Ramata Island, which is on the western end of the beautiful Marovo Lagoon, which is the world's largest island fringed lagoon. Mavo Village is quite untouched by western influences however, the Mavo people welcome families, couples and small groups to the island to experience the Solomon Island culture, beauty and fishing! It is quite a small community with around 300 villagers. After having taken their own children to the island a couple of years ago, the Firrell Family returned again recently bringing with them clothes, educational materials for their schools and gifts for the children of the village. With culture being very important to the Mavo people, the Firrell's felt that it was important to offer simple items that would not be contrary to their beliefs and culture. The Firrell Family were concerned about the Mavo peoples limited access to oral health facilities and supplies and Medland Dental Centre was pleased to donate children's toothbrushes and toothpaste to children of the village. It was wonderful to hear from the Firrell family about Mavo Village and the beautiful, caring people in this village. The Mavo children have very little compared to Western children however, are so happy just doing what they do. We were very happy to help out in this little way. We love to hear stories from our patients and what they are doing in the community, whether local or further afield.